NEW YORK (CNS) — The end is nigh, mercifully, in “Maze Runner: The Death Cure” (Fox), based on the third and final novel in James Dashner’s sci-fi trilogy. And none too soon. Our intrepid band of teenagers, the “Gladers,” look positively worn out, having now spent three movies running for their lives from an evil entity in a dreary (and very dusty) post-apocalyptic world. Equally tired is T.S. Nowlin’s threadbare screenplay, which returning director Wes Ball conducts at a breakneck pace, turning this film into a white-knuckle roller-coaster ride overstuffed with relentless (if bloodless) violence and more vehicle crashes than you can shake a stick at. From their perch in the aptly named “Last City” sit the leaders of the “World in Catastrophe: Killzone Experiment Department,” or WCKD. Their (“wicked” indeed) leader, Dr. Ava Paige (Patricia Clarkson), seeks a cure for the virus from the Gladers, who are surprisingly immune. At her side is Teresa (Kaya Scodelario), a Glader turncoat and erstwhile squeeze of the leader of the teen pack, Thomas (Dylan O’Brien). The WCKD have abducted Minho (Ki Hong Lee) and several other teens, who become guinea pigs for torturous experiments, since the antidote to the plague may lie in their blood. Like a dystopian Robin Hood, Thomas leads a merry band of mates, including sidekick Newt (Thomas Brodie-Sangster), out of the forest to stage an assault on the Last City and liberate the captives. Along the way the gang express worthy virtues of friendship, loyalty and self-sacrifice. 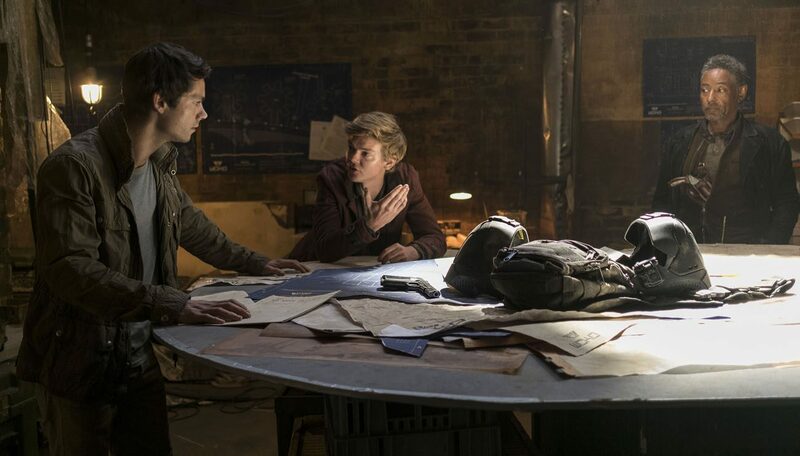 Viewers of faith will be intrigued by Christian symbolism and references, including the Gladers’ life-giving blood, a church setting which offers sanctuary, and a character who blesses himself in thanksgiving. While incidental to the plot, they are welcome relief from the ear-splitting boom-boom of the guns and bombs. Lastly, on a timely note, much is made of the fact that the Last City, which rises from the scorched earth like a gleaming Oz, is surrounded by an impenetrable wall, designed to keep out undesirables (hint, hint). But there is no mention of who paid for the wall’s construction. The film contains relentless but bloodless violence and gunplay, scenes of torture, occasional crude and profane language, and one offensive gesture. The Catholic News Service classification is A-III — adults. The Motion Picture Association of America rating is PG-13 — parents strongly cautioned. Some material may be inappropriate for children under 13.